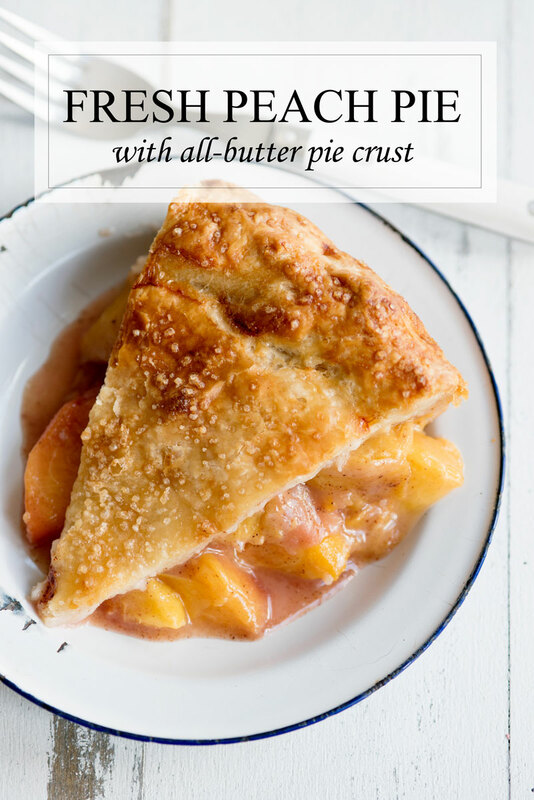 Nothing says summer like a fresh peach pie with all butter pie crust. This recipe is for the best pie you’ll ever eat! I dare you to have just one piece. I’m losing my mind right now. 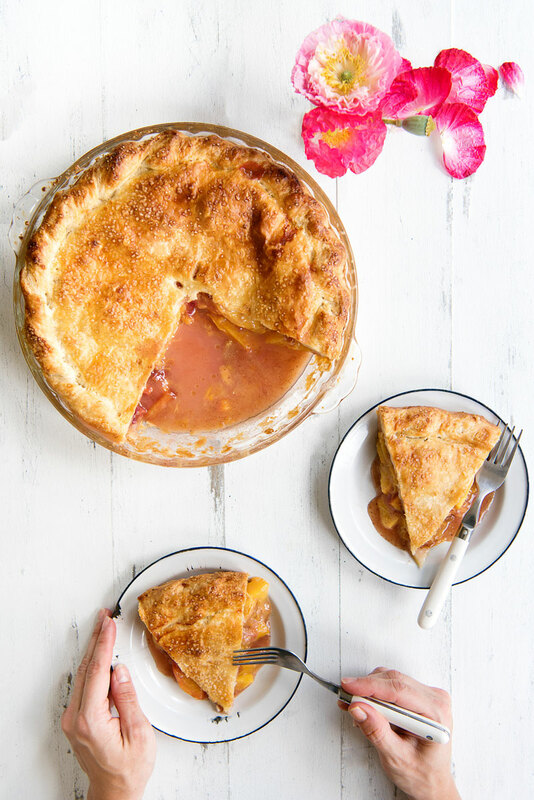 It’s officially peach pie season and I can’t get enough. We buy peaches by the bushel to satisfy my cravings and I will literally sit down and eat four peaches in a row, no problem. I’ve been craving peaches for months, basically since September. I’m over the moon happy with the fact that peaches are everywhere now! Peach season means I get to start making peach pies again. 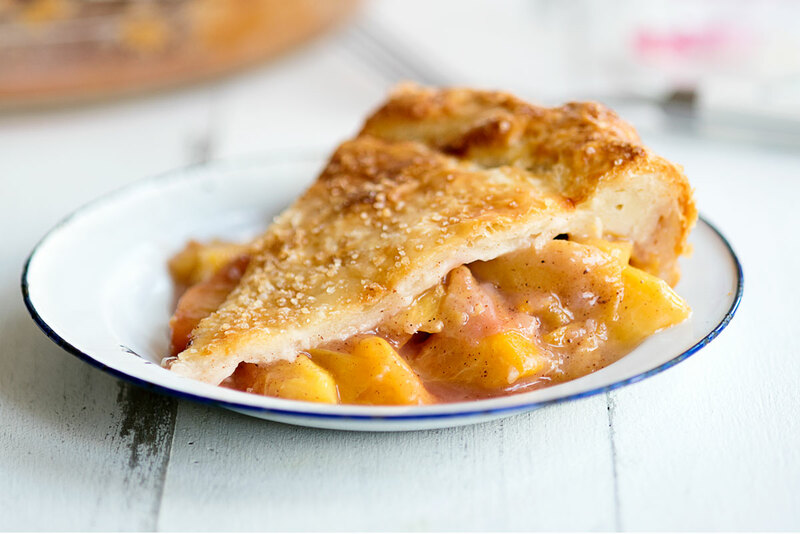 For a few years, I tried to freeze peaches so that we could enjoy peach pies in the dark winter months, but it just wasn’t the same. So here is my first peach pie of the summer made with love and with thankfulness that I have the next few months to indulge in peach goodness. Hello, old friend. 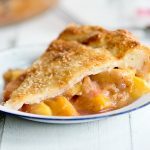 This peach pie was made with my all-time favorite all-butter pie crust from Four & Twenty Blackbirds Bakery’s Pie Book. You can find the instructions on this post here. Combine peaches, sugar, flour, and spices in a bowl and toss to coat. 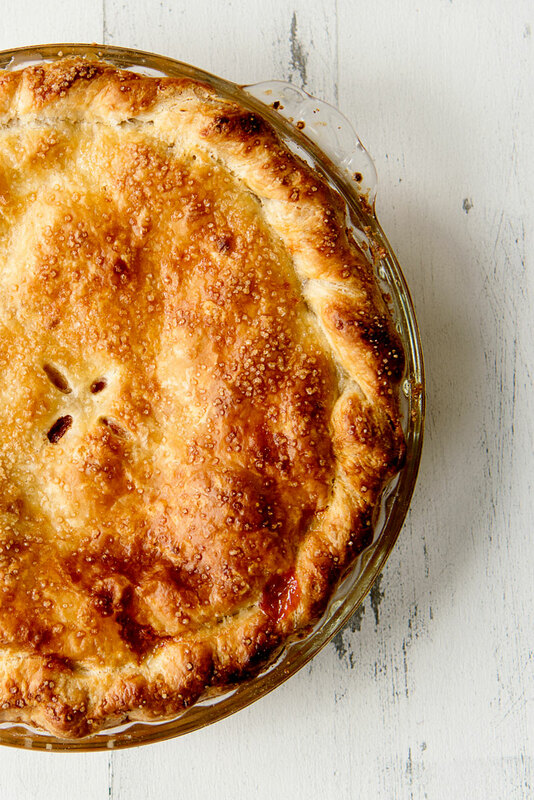 Roll out one all-butter pie crust round (recipe here) and place it in your pie plate. Spread the coated peaches evenly in the pie plate. Roll out the second pie crust round and cover your pie dish. Trim the edges to approximately 1 inch and roll the dough up and crimp to seal to form the crust edge. Coat the pastry dough with egg wash, cut some steam vents using a knife and sprinkle with sugar. Bake at 425° Fahrenheit for 30 minutes, without opening the oven, reduce temperature to 350° F and bake for another 30 minutes. Pro tip: If you are looking for the easiest way to roll out a pie crust, pie board is the best $30 you will ever spend. Ok… is there anything you can’t do!? This is unreal. I want all butter everything and I think pie crust is a good place to start! You are too sweet! Pie crusts are definitely best with butter! My heart almost exploded when I saw the bins of stone fruit at the market. I am going crazy for them. 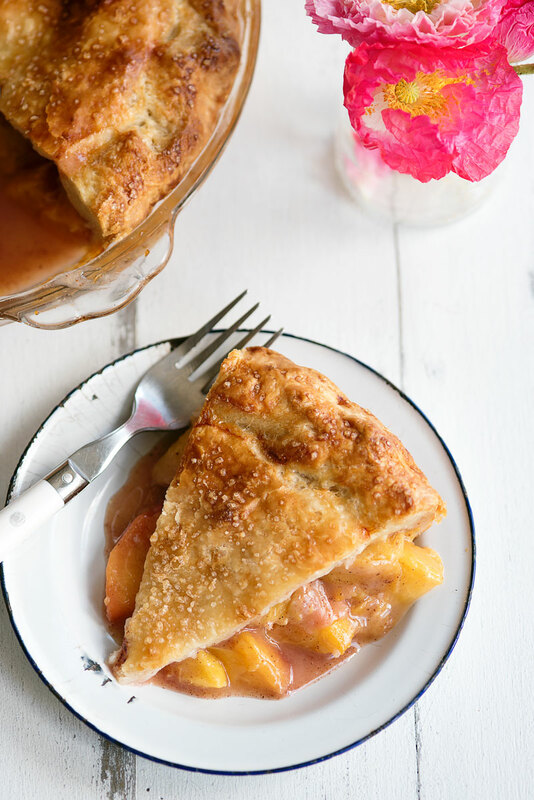 Peach pie is one of my favorites and this one looks delish! Love the lattice top crust! Mmmmmmm! This looks sooooo good! That crust just looks like it would melt in your mouth. Absolutely! I’m actually making it again today because I just can’t get enough! Oh my goodness Preeti!!!! Thanks so much for catching my “cut and paste” error from my apple pie post! I meant to cut and paste the dough ingredients and instead I did the filling! Thanks for pointing this out! I am going to make a peach pie this week. California peaches are AMAZING. Oh great! I’ve made 3 peach pies in the last month! I can’t get enough. Plus the dozens that I’ve eaten a la carte…..
Wonder what recipe you’re reading? Hi – This is actually a recipe that has been passed down in my family. my mom taught me to make it when I was little! This looks sooooo good! My daughter is a stone fruit fanatic so we always have some in the house during the summer. Thanks Anne! Speaking of, I just came home with a humongous bag of peaches! Got a get them while they are in season! We grew up with this made as a cobbler with layers of crust inside and on top. Sounds heavenly! I’d love to try it! Do you use a regular pie dough? Any tips for me before I make one? If i don’t have fresh peaches, can i use canned? Hi Leslie – I can’t say for sure because I’ve never tried, but I suspect it would be ok. Just taste whatever the peaches are packed in, you may need to add less sugar if they are packed in syrup. Let me know how it turns out so I can share that info with my readers! So you used fresh peaches for this recipe? …mine were fresh, but frozen and I thought they were slightly mushy…. Hi Teresa – I’ve never used frozen fruit so I’m not completely sure. 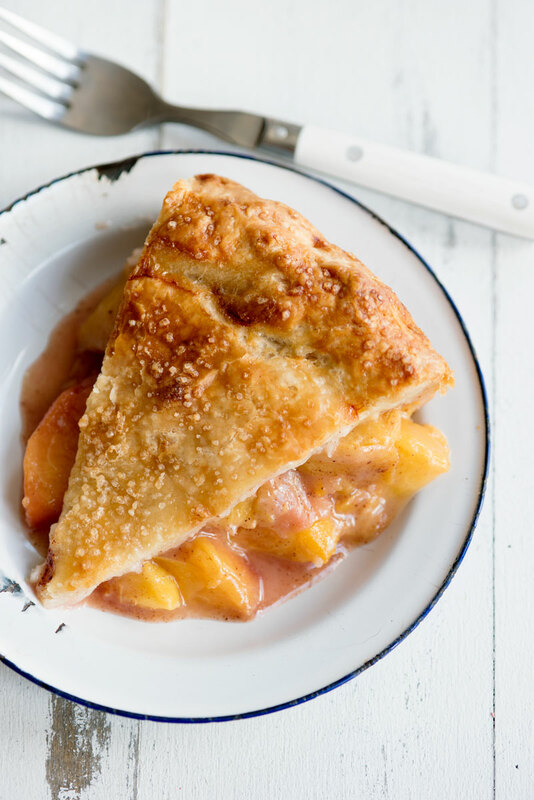 We really only make this with fresh, peak season peaches! My suspicion is the mushiness might be something to do with the freezing process, or maybe they used lower quality fruit for freezing? I highly recommend pinning this recipe and bringing it back out next summer when the peaches are at their best! Such an awesome and delightful dessert! I will have to try it out soon, Kelly! You have too!!! It’s the best summer dessert! Wow, what a delicious pie! Since I felt challenged making the pie crust, I ordered the pie board you recommended. My husband is raving over how superb this pie is. I can see with the pie board coming soon, I’ll be making pies more often! Sally – you made my day! I’m so glad you loved this pie. The pie board is seriously life changing. The more you use it the more flour gets worked into the fabric and the better it works. I just scrape it with a knife when I’m done and only wash it if there are spills!